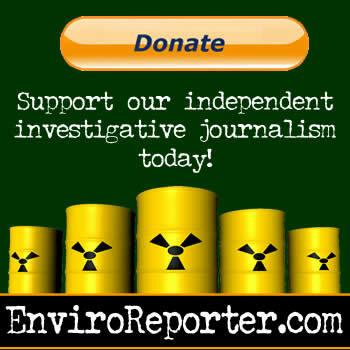 EnviroReporter.com has confirmed through two independent sources that signing of final agreements between the California EPA’s Department of Toxic Substances Control (DTSC) and the Department of Energy (DOE) and NASA for the cleanup of the former Santa Susana Field Laboratory site in Simi Valley will happen later today. The agreement calls for the cleanup of the DOE and NASA parts of the 2,850-acre laboratory, commonly known as Rocketdyne, to be cleaned up to “background” levels of radiological and chemical contamination, restoring the site to its natural levels of pollutants in a multi-million remediation of the property scheduled for completion in 2017. Lab owner Boeing has not agreed to clean up its massive area of responsibility at the site to background levels. Boeing is currently suing DTSC in court over what it perceives are too strict cleanup levels. This is the same agreement that EnviroReporter.com wrote about in “Sleight of Land” on September 23, 2010, the same day Michael Collins’ LA Weekly article “Rocketdyne Cleanup Won’t Help Runkle Canyon” was published. Updates to this announcement, along with comments and analysis, will be forthcoming later today once the agreement is formally signed. Check back here for our expanded and exclusive coverage. News of the agreements between between California’s Department of Toxic Substances Control (DTSC) and both the federal Department of Energy (DOE) and the federal National Aeronautics and Space Administration (NASA) set off a wave of euphoria rarely experienced in the long saga of the Santa Susana Field Laboratory. From government officials to activists to community members, news that the long fought for agreements were now a reality brought out a wide range of reactions including the desire to see Boeing sign on to the same simple concept – clean up the lab back to its natural background level of radiation and chemicals. Boeing, however, shows no signs of backing down. Company officials say that excavating 1.6 million cubic yards of soil will have to be dug out of Rocketdyne to get rid of the contaminated dirt rendering the lab a “moonscape.” The Rocketdyne Cleanup Coalition says Boeing’s estimates are nonsense. Digging their heals in even deeper, on a recent Internet recorded chat, Boeing head Art Lennox said that the 1.6 million cubic yards of soil didn’t include the radioactive dirt at Rocketdyne nor the soil impacted by toxic vapors, suggesting that Boeing claims that the number could be far higher. Even after listening to Boeing’s story change over the last thirteen years, it is still surprising that the company, supported by a smattering of fringe cleanup agreement naysayers, has come up with the argument that the lab, essentially, is too polluted to be cleaned up. This after years of saying there was barely any pollution at all. Regardless, this selection of press releases and quotes sent to EnviroReporter.com illustrate that years of dedicated work and common sense science can sometimes win the day. But at the end of the day, all the good science in the world means nothing if there aren’t people there who care about it enough to stand up for themselves. SACRAMENTO, Calif., – An historic moment in the environmental cleanup at the Santa Susana Field Lab (SSFL) site was reached today with the signing of agreements between California’s Department of Toxic Substances Control (DTSC) and both the federal Department of Energy (DOE) and the federal National Aeronautics and Space Administration (NASA). The agreement incorporates the provisions of the State’s stringent environmental standards and an accelerated approach to cleaning up low‐level radiation and toxic chemical contamination. The agreement meets the high bar set by Senate Bill 990 which requires the entire SSFL property to be cleaned up to stringent and protective standards, and places the cleanup of both chemical and radioactive contamination under the oversight of DTSC. The agreements cover DOE’s 290 acres and NASA’s 451 acres of the SSFL site. The remainder of the property is owned by the Boeing Company. SSFL is a former rocket engine test and nuclear research facility on more than 2,800 acres along the border of Los Angeles and Ventura counties. The Boeing Company, NASA and DOE operated facilities on portions of the property from 1949‐2006, and are responsible for the cleanup overseen by DTSC. The state has been in negotiations with all three responsible parties for several years. DOE once operated several nuclear reactors, associated fuel facilities and laboratories on what is known as “Area IV” of the SSFL facility. NASA conducted liquid‐fuel rocket engine testing on its portion of the facility (Area II and part of Area I). The agreement integrates the United States Environmental Protection Agency’s (U.S. EPA) radiological survey work into the site investigation, using U.S. EPA’s expertise and resources to identify areas of radiological contamination needing cleanup. The timing of the agreement allows for the state to maximize resources by using U.S. EPA’s survey, accelerates the cleanup timeline and also avoids costly duplication of effort. Radiological wastes will be disposed at a permitted DOE facility, while hazardous wastes will be taken to a permitted hazardous waste disposal facility. In December 2008, Boeing sued DTSC over the enforceability of the bill, and continues to clean up the property under an earlier agreement that is not to the stringent environmental standard called for in SB 990. “We hope we can reach a similar agreement with Boeing, and that our continued negotiations bear fruit as they did with DOE and NASA,” said Adams. Copies of the agreements and the response to comments can be found at www.dtsc.ca.gov. Washington, D.C. – The Department of Energy and NASA both signed Administrative Orders on Consent (AOC) with the California Environmental Protection Agency (Cal EPA) today that define the process for characterization and the cleanup end-state for portions of the Santa Susana Field Laboratory (SSFL). The agreements come after more than 10 months of negotiations and extensive public comment on the conceptual framework for cleanup outlined in the Agreement in Principle and additional public comment on the legally enforceable process and procedures in the draft Administrative Order on Consent. “By working closely with the State of California, we have reached an historic agreement that will allow the Department to carry out its important cleanup work and protect the health of both the surrounding community and the environment,” said Secretary of Energy Steven Chu. DOE’s agreement is a commitment to clean up Area IV and the Northern Buffer Zone of the SSFL to background levels for both chemical and radiological constituents. DOE’s AOC includes several key steps needed to reach the desired end-state of a cleanup to background. • The California Department of Toxic Substances Control (DTSC) will determine the chemical background for each potential chemical constituent based upon their on-going chemical background study. • The USEPA will determine, through the ongoing radiological characterization survey, the nature and extent of any remaining radiological contamination. • DTSC will determine the nature and extent of any remaining chemical contamination based on the previously submitted chemical sampling results, results from co-locating samples with USEPA for chemical analysis, and any DTSC determined necessary additional sampling. • A major component of the framework is the involvement of USEPA to serve as technical advisor to DTSC and DOE. USEPA will perform confirmatory sampling after DOE has completed cleanup to help ensure that all cleanup goals have been met. USEPA will also approve for use DOE identified areas of backfill. In addition to providing the legal framework for the agreement, the Administrative Order on Consent also outlines a process to address the court-ordered Environmental Impact Statement. The Administrative Order on Consent will be available here. 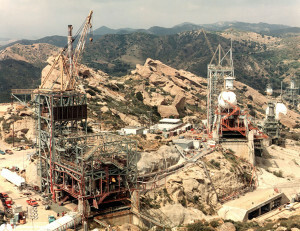 NASA is responsible for the environmental cleanup of the Federal real property at the Santa Susana Field Laboratory. The NASA-held (Federal) portion of the site has been used historically for the research, development and testing of rocket engines associated with the Apollo and Space Shuttle Programs. Under NASA’s AOC, the agency will work with the California Department of Toxic Substances Control to determine the chemical background for each potential chemical constituent based upon their on-going chemical background study. The agency will also work with DTSC to determine the nature and extent of any remaining chemical contamination based on the previously submitted chemical sampling results, and any DTSC-determined necessary additional sampling. Originally developed as a remote site to test rocket engines and conduct nuclear research, the 2,850-acre SSFL, located in the hills between Chatsworth and Simi Valley, is owned primarily by the Boeing Company, with small portions administered by the NASA. The former Atomic Energy Commission conducted nuclear research on nuclear powered space vehicles and sodium coolant mediums at 10 small reactors at the Energy Technology Engineering Center – 90 acres within SSFL Area IV – from the 1950s until 1988. “The signing today of the final Agreements on Consent between the California Department of Toxic Substances Control and the Department of Energy and NASA for cleanup of the SSFL is nothing short of stupendous. Fighting the might of two huge Federal bureaucracies has been no picnic, and sometimes it seemed that this day would never come. But at the same time, I knew that it must come. Too many people around that site were sick, and too many had fought for far too long to get these agencies to clean up the radioactive and chemical mess that they left behind. Thanks to these agreements, the areas on which the DOE and NASA conducted their activities will now be cleaned up to background levels, which means as close as possible to what the site was before all the rocket engine testing and chemical spills and partial nuclear meltdown and everything else took place. It essentially winds back the clock to the time when families could safely hike and enjoy this beautiful land and never had to worry about breathing toxic waste or carrying it home on their clothes. There are far too many people to thank by name who helped bring us to this point, but they certainly must include California EPA Secretary Linda Adams, who personally grabbed hold of this project and never let go until the DOE and NASA put pen to paper on final, binding, and enforceable agreements. A true environmental hero. And those signatures likely still wouldn’t have happened but for the personal intercession of Nobel Peace Prize-winning U.S. Secretary of Energy Steven Chu, NASA Administrator Charles Bolden, and U.S. Senator Barbara Boxer. Assemblymember Brownley is principal co-author of SB 990 along with then-Senator Sheila Kuehl, which set the cleanup standards for the site into law in 2007. AGOURA HILLS, CA – Senator Fran Pavley (D-Agoura Hills) today praised community activists as well as state and federal agencies for the historic agreement to clean up the Santa Susana Field Lab, one of the most contaminated sites in the United States. The Santa Susana Field Laboratory (SSFL) is located 30 miles northwest of downtown Los Angeles in southeastern Ventura County, near the crest of the Simi Hills at the western border of the San Fernando Valley. A former rocket engine test and nuclear research facility, the 2,849-acre field laboratory has been the focus of a comprehensive environmental investigation and cleanup program, conducted by Boeing, the United States Department of Energy (DOE) and the National Aeronautics and Space Administration (NASA), and overseen by the Department of Toxic Substances Control. The clean-up agreement covers DOE’s 290-acre portion of the facility and will fully implement SB 990, legislation authored by former State Senator Sheila Kuehl, who represented Senate District 23, from 2000-2008. This enforceable agreement, when implemented, will result in the removal of toxics to the level that existed before 30,000 rocket tests occurred, resulting in tons of deadly chemicals contaminating the air and soil. State and federal governments signed agreements today to clean up toxic contamination at Santa Susana Field Laboratory (SSFL), a former nuclear reactor and rocket testing facility in the Simi Hills overlooking the western San Fernando Valley and Simi Valley. The clean-up agreements were lauded by Committee to Bridge the Gap and the Natural Resources Defense Council, two organizations that have worked for decades with the nearby communities seeking thorough site remediation. SSFL housed ten atomic reactors, four of which suffered accidents, including a partial fuel meltdown in 1959, as well as tens of thousands of rocket tests. Site activities resulted in widespread radioactive and chemical contamination. The agreements were executed today by the California Department of Toxic Substances Control, the U.S. Department of Energy (DOE), and NASA, and cover the DOE and NASA portions of SSFL. Long-time resident Dawn Kowalski, who lives just beneath the SSFL facility, said, “What a huge victory. Thank you DOE and NASA for stepping up to the plate and restoring the site. Our neighborhood the Susana Knolls is nestled below the SSFL field lab and has lived in the shadow of this contaminated site for decades. We have fought to have the site cleaned up for over twenty years. It has been a long and at many times a fierce battle. “Now we just wait for Boeing to do the right thing and sign a similar consent agreement and clean up their portion of the site. But let us not overshadow the glorious victory of today. DOE and NASA have now shown their concern for us their neighbors and for that we applaud them. “We will soon be able to fall asleep at night and not worry about the contamination on the hill oozing down the mountain, or blowing off in the Santa Ana winds to rest on unsuspecting souls. Members of the Rocketdyne Cleanup Coalition, who have worked for two decades to achieve today’s historic development, expressed great joy over the signing of the breakthrough agreements with the Department of Energy and NASA for the cleanup of contamination at the Santa Susana Field Lab. SSFL is a polluted nuclear and rocket testing facility in the hills overlooking Simi Valley, Thousand Oaks, and the western San Fernando Valley. Site of a partial nuclear meltdown, other reactor accidents, illegal disposal of hazardous material, and thousands of rocket tests, the radioactive and chemical contamination has long been of concern to those who live beneath the site. The Coalition has fought since 1989 to get the site cleaned up. “Wow, this is a day we have all been waiting for and a day many told us would never happen and why not just give up. Now after 21 years there will be an agreement for this cleanup. We have attended more meetings than we can count, our children have grown and now have children of their own but finally a real cleanup. I thank DOE and NASA for finally doing the right thing. “This has been a long time coming. For over two decades we have been waiting for this day to come. “In 1989 the communities beneath the Santa Susana Field Lab learned that nuclear work had been done in the hills above us, that in 1959 there had been a partial nuclear meltdown, and that there was widespread radioactive and chemical contamination. From 1989 on, community activists have attended endless meetings, have ploughed through piles of information, and have been given many broken promises, but no concrete action. On December 6, 2010, finally, after much controversy, the deserving public will have what has been long fought for – binding agreements signed by two of the responsible parties – Department of Energy and NASA – for a cleanup to meet the standards of SB990, the state cleanup law. This is a huge victory for which we have long worked. Unknowingly raising my three children near the site of a nuclear disaster has been without doubt the most disturbing part of my life. The signing of this agreement means that someday children nearby will grow up without the danger of radioactive and chemical contamination, and I am incredibly grateful to the DOE, NASA, the DTSC, the EPA and all other people responsible. I’m gratified that our leadership in California and Washington has finally seen fit to move forward with this process. I hope these first important steps will eventually lead to a clean, safe environment for our kids to enjoy. On behalf of the residents of Oak Park and surrounding communities I am very pleased that an agreement has been signed to clean up the contaminated SSFL site to background levels. I express heartfelt thanks to Dan Hirsch of Committee to Bridge the Gap and our elected officials past and present including Fran Pavley, Julia Browley, Linda Parks and Barbara Boxer for the brave leadership that has brought us to this historic agreement. Also special thanks are due to the many activists including our own Oak Park High School students who have worked toward this cause and never gave up hope. What are/were the “natural” levels? What are the radiation levels now? What does Boeing say the levels should be?